“Heroes” has been getting a lot of talk lately because of its great cast and Golden Globe nomination this year. The news keeps getting better. The distinguished and talented actor, George Takei, who played Sulu on the classic “Star Trek,” has come aboard this season as Hiro’s father, Kaito. His character portrays a very powerful industrialist with multi-faceted sides to his personality. Now, viewers have another good reason to turn on their TV sets to see the ever popular show on Monday nights. Takei became familiar with “Heroes” after receiving e-mails from fans telling him about the series and the Japanese character, Hiro, who is played by Masi Oka. Soon afterward, Takei was contacted by his agent with the news that there had been considerable interest in him auditioning for the part of Hiro’s father. It was an unexpected, but pleasant surprise. One of the requirements was that the actor had to translate the script and perform his audition in Japanese. Although born in California, he learned Japanese at an early age. The first meeting on the “Heroes” set between Takei and Oka was a unique experience for both actors. Takei is excited about his new role as Kaito Nakamura. An interesting tidbit of info about his character’s name is that in real life his mother’s maiden name was Nakamura. His nephew’s five year old son’s Japanese middle name is Kaito. As Hiro’s father, Takei isn’t sure how his character will emerge in future episodes. It’s not yet known if Kaito has passed down the special powers that Hiro possesses. One of the noticeable differences between father and son is that Hiro tends to be a bit more humorous at times. “There is just a hint of humor, more in the ironic sense, in Kaito Nakamura that I have detected in the script so far. I’d like to see more of that developed, but the keepers of my destiny are the writers. 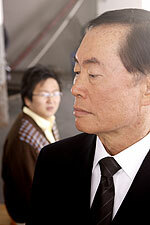 They dole out to me who I am, and why I do what I do, and what my intents are,” said Takei. He feels that “Heroes” shows a glimpse of what could very likely become an integral part of our future. Scientific discoveries made over the progression of time have continually changed our way of thinking and living on this planet. He said, “Absolutely, I think so. Some of the things that are absolutely inconceivable to people at a certain point in historyfor example, my grandmother came to the United States in the early part of the twentieth century. My grandfather came in the nineteenth century. She said that trip across the Pacific took her something like six weeks rocking around on a ship. She said if anyone told her that you could get in a steel machine and fly over the Pacific, she would have said, ‘You’re crazy.’ Well, in their lifetime, she did it many times, going back and forth between California and Japan. She lived to be 105 years old. “…Anything that is conceivable, I think, will eventually happen. I am kind of amused by the fact that when “Star Trek” came on in 1966, that was pure science fiction. The technology was just mind-boggling science fiction. We had the consoles that we communicated with various other ships across the galaxy. That is our computer today, isn’t it? “We had another amazing sci-fi device that we wore on our hips. Every member of the crew wore this device. We walked around on the set and whenever we wanted to talk to someone, wherever we were, we’d rip off this amazing device, flip it open and start talking. Today it is a very real nuisance in our lives. Trekkie fans will be happy to know that in addition to his role in Heroes, Takei will be revisiting his “Star Trek” character of Mr. Sulu on a new series called “Star Trek: New Voyages.” He said the fantastic script was the deciding factor on him doing the role. In this series, he has a daughter, which will add another dimension to the show. “Star Trek: New Voyages” is scheduled to premiere in late March in Orlando, Florida. Then, it will be web-cast. It is almost in the final editing stage now. 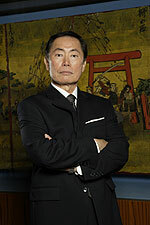 In the mean time, George Takei fans can enjoy watching him portray Kaito in a more prominent role on “Heroes” that will air Monday night, February 5th on NBC.